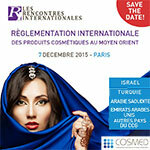 On Monday, December 7, 2015, COSMED (the association of SMEs in the cosmetics industry) is organizing in Paris a day devoted to the international regulation of cosmetic products in the Middle East. This new edition of the International Meetings in partnership with Business France will cover five zones: Israel, Turkey, Saudi Arabia, United Arab Emirates and other Gulf Countries. The Near and Middle East consists mainly of the Gulf Cooperation Council (GCC), which is composed of six States: Saudi Arabia, Oman, Kuwait, Bahrain, the United Arab Emirates and Qatar, and one observer country, Yemen. These countries that wish to harmonize their regulations, particularly those for cosmetics, have a standardization body, the GSO (GCC Standardization Organization). While discussions are currently underway at the GSO to approximate regulations, many differences remain in accessing each state's market. On 7 December, Business France's export advisors will present the growth markets, opportunities and pitfalls to avoid in each market. Then expert speakers will present, zone by zone, the regulation of cosmetic products and the latest developments. Israel The expected publication of the new cosmetic regulation will be handled by Rinat Bashar of the Israeli Ministry of Health. A focus will also be made on the particular case of nanos. Indeed, pending the publication by the European Commission of the nanos guide, products containing nanoparticles cannot be imported into Israel. Saudi Arabia Sithara Hatim, SGS Dubai, will provide a comprehensive overview of the regulations in Saudi Arabia and detail the new mandatory modalities for the registration of cosmetic products.